The NCWHS is pleased to welcome a new institutional member, Historic Philadelphia’s Betsy Ross House. In the article below, museum director Lisa Acker-Moulder describes an exciting new initiative there, to expand interpretation of women in artisanal trades in Revolutionary Philadelphia. Welcome aboard, and thanks for sharing your exciting new program! The Betsy Ross House recently created a new living history exhibit designed to further expand visitors’ understanding of Betsy Ross and her work beyond flagmaking. Dressing the Bed(made possible with funding provided by the Coby Foundation, the Pennsylvania Humanities Council and the Pennsylvania Historical and Museum Commission) takes place in the site’s fully-functional upholstery shop and is staffed by first-person Betsy Ross interpreters. The research portion of Dressing the Bed (which was complemented by “Recovering the Past: The Upholstery Trade in Colonial Philadelphia,” a gallery exhibit installed to complement the new upholstery shop interpretation) began last spring, with the Betsy Ross House staff and interpreters studying the appropriate styles, techniques and installation. The team was given access to study the collections of extant eighteenth-century bed curtains in the collections of Colonial Williamsburg, Winterthur, Stenton, Wyck, Pennsbury Manor and the Philadelphia Museum of Art. The grant-funded project also allowed us to engage the expertise of Linda Eaton, Director of Museum Collections at the Winterthur Museum, Gardens & Library, one of the nation’s foremost experts on early American textiles. 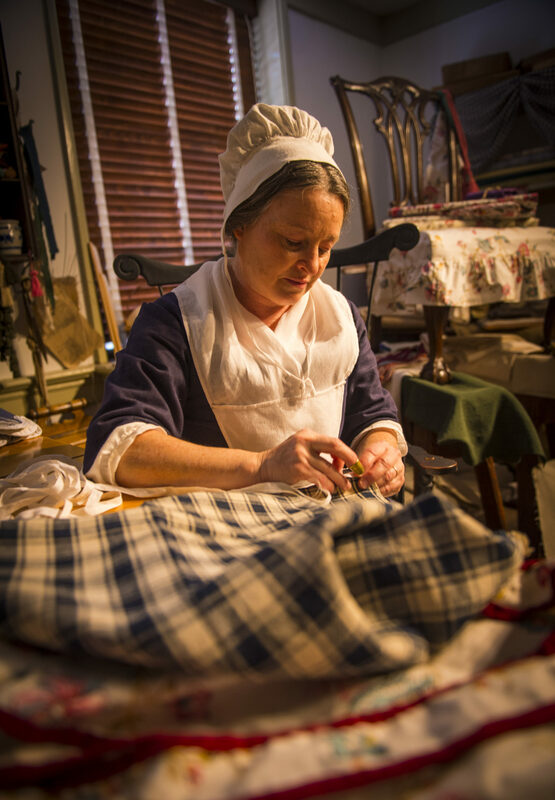 Building on relationships thickened in 2010 and 2011 when the Winterthur Museum conserved a flag made by Betsy’s daughter Clarissa Wilson, Eaton provided the Betsy Ross House team access to rare eighteenth-century bed curtains. This research will not only benefit the Dressing the Bed project, but it will also enhance our interpretation of Betsy Ross as a professional upholsterer and not just a flag maker. Stitching on a mock-up valance was completed in August. Work on the bed curtains is expected to take about 18 months to complete, with installation tentatively set for December 2014. Dressing the Bed features a highly trained, costumed and in-character Betsy Ross interpreter stitching reproduction bed curtains using eighteenth-century hand-sewing techniques and accurate, hand woven, hand dyed reproduction fabrics, while also explaining the work to visitors. All of the labor for this exhibit will be done in public view, and the completed curtains will entirely be the work of the interpreters. When finished, the bed curtains will be installed in Betsy Ross’ bedroom for ongoing display. The new exhibit presents an opportunity for the House to tell visitors a broader story about Betsy Ross’ life as a tradeswoman, including the economics of the work, the cost, color and texture of colonial cloth, the sewing techniques and designs used by eighteenth-century upholsterers, and contemporary upholsters who may have collaborated with Betsy Ross. 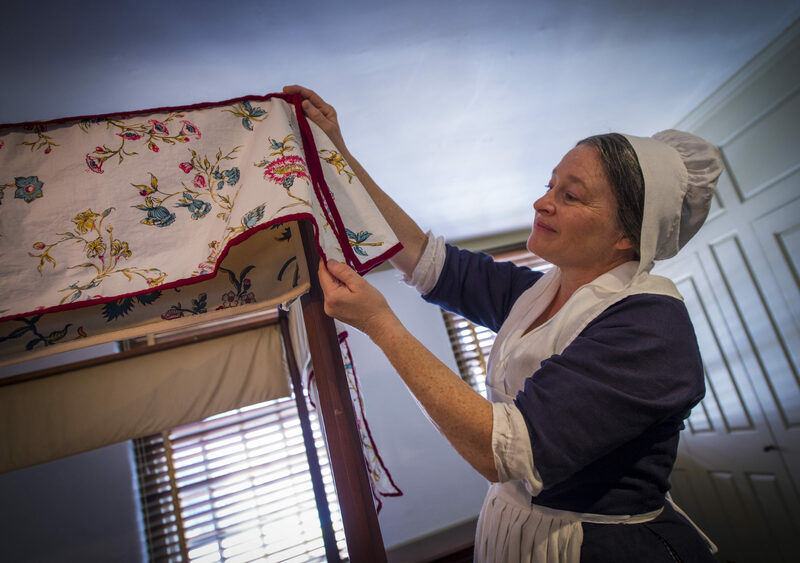 While many visitors come to hear the flag-making story (the Betsy Ross House is one of Philadelphia’s most popular historic attractions, with more than 200,000 visitors annually), others are interested in women’s history and many are fascinated by the work of eighteenth-century upholsterers. 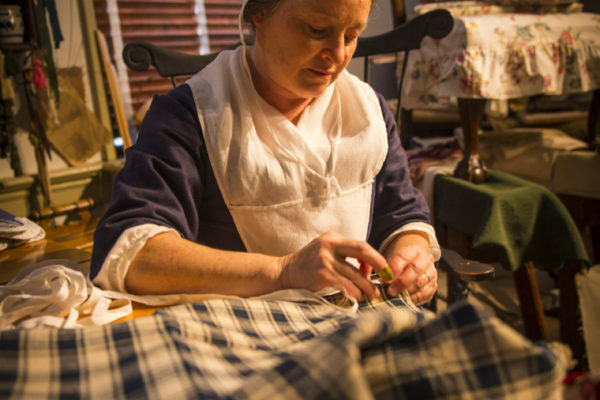 By having our Betsy Ross interpreters present in the shop every day, each visitor can have a customized interaction with Betsy suited to what they find most interesting. We often hear from our visitors that interacting with “Betsy Ross” and learning is the highlight of their experience; interpreting through her the lives of Philadelphia craftswomen more generally through this exhibit on the upholstery trades has proven a great way to draw on interest in Ross to tell a broader story about women, work and the American Revolution.